Q: Why is it that pineapple and eggs never seem to get along? There seems to be some acid or enzyme in the pineapple that will cause the eggs to break. A: You’re right on both! 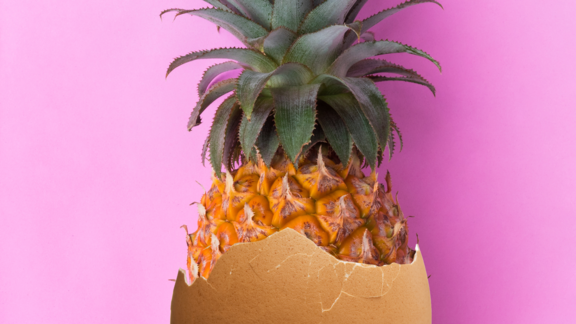 Pineapples are super acidic, and if you leave an egg in any acidic environment for too long, you’ll start to wreak havoc on the proteins in the white and the yolk. At Eleven Madison Park, they quick-cure egg yolks in citrus juice or vinegar for an hour or so before putting on tartare—the partial coagulation of the yolk makes for a creamier texture without turning it into egg ceviche. The other issue with pineapple and egg is indeed an enzyme. Pineapples come from tropical climates, as do tons of annoying bugs. The going theory is pineapples (along with papaya, kiwi, and figs) evolved protein-digesting enzymes to keep the bad guys at bay, digesting larvae and eggs before they grow and destroy the fruit. Mixing chicken eggs with raw pineapple is like throwing a fishing net into a dumpster of razors; at my first restaurant job, I tried to make a raw pineapple crème anglaise for a dessert and ended up having one of the rougher nights of my career. All that said, raw pineapple and egg could be an amazing combination if taken to the extreme. If left alone for a few weeks with enough salt to ward off pathogens, that protein digestion spree would yield a bunch of savory amino acids, and you could theoretically make a really amazing condiment similar to soy sauce. Ali Bouzari is a culinary scientist and the author of your favorite book, Ingredient. You ask, Ali Bouzari answers: here's what the coolest scientist we know thinks is coming next.